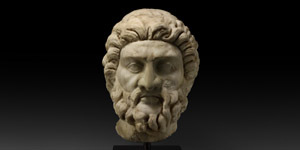 A monumental head of Asclepius or Jupiter (Greek Zeus), carved much larger than life-size in high quality marble, with a full head of curls in tiers with deep undercutting around the brow; the beard similar well defined with tiered curls; the face stern with furrowed brow and high cheek-bones, lentoid eyes with heavy lids and restored nose; mounted on a custom-made stand. 48.5 kg, 61cm (24"). Fine condition. Rare in this monumental size. Property of a central London gallery; acquired from Brok S.L. auctions, Barcelona, Spain, November 1984, lot 586; formerly in the private collection of L.B. Godó, Barcelona, Spain; accompanied by a copy of the 1984 catalogue listing and auction invoice; supplied with geologic report No. TL005200, by geologic consultant Dr R. L. Bonewitz. Depictions of bearded gods frequently represented either Asclepius, god of healing, or Zeus. The monumental proportions suggest that it may have come from a large cult statue frequently situated within a temple.